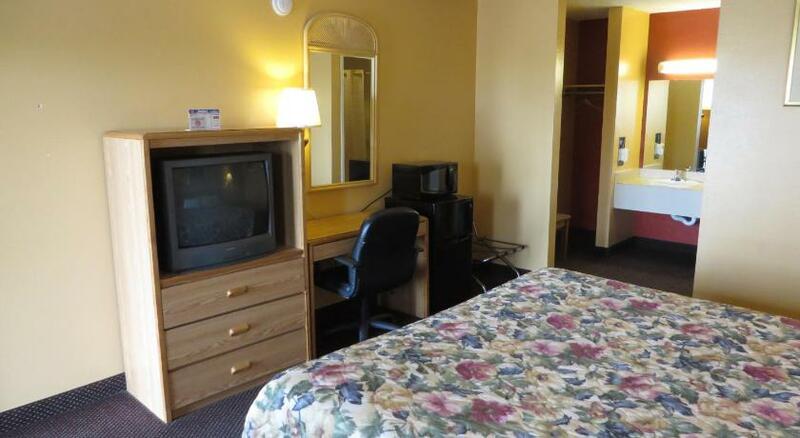 The Economy Inn & Suites Joplin has 30 simply decorated and clean rooms. In all the rooms of this hotel, a microwave, refrigerator, and a small activity desk are included. Each room has a private bathroom. Towels and linens are also provided to the guests. An outdoor pool is also featured by this property. Free self-parking service is provided. Air conditioning is available in all rooms of this hotel. It's a pet-friendly hotel and Wi-Fi connection is available in all of its rooms without any charge. The reception desk is open 24/7 for greeting the guests. Unlimited local calls is another winning feature of this accommodation. The Sakura Sushi & Grill Restaurant and Del Rio Grill & Cantina Restaurant are situated at a walking distance from this hotel. Joplin Regional Airport is just 10.9 km from Economy Inn & Suites Joplin but it covers a shorter distance than most of the hotels in Joplin Mo. An amazing city in Missouri, Joplin is situated on route 66, offers a big list of amazing places to its visitors. The Candy House Gourmet, George Washington Carver National Monument, Joplin Museum Complex, Route 66 Park, Sandstone Gardens, Sweet Caroline's, and Schifferdecker Park are some of the must-visit places of this city. And for a comfortable and convenient stay in this city near amazing spots, nothing could be better than the Economy Inn & Suites Joplin.